Candidates above 18 applying for any of the three mentioned Jobs must not exceed the upper age of 30 years as reckoned on 01-07-2018. 1. 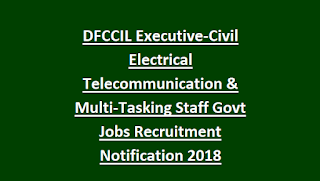 Executive: Must have secured 3 years Diploma is the concerned discipline with not less than 60% aggregate marks from a University/Institution recognized by AICTE. 2. Junior Executive: Must have passed 10th Class with minimum two-years of Apprenticeship successfully completed under relevant field. 3. Multi-Tasking Staff: Must have passed 10th Class with minimum one-year of Apprenticeship under concerned discipline. Note: Candidates belonging to SC/ST/PWD category are exempted from paying any application fee. Applicants who have successfully applied to the desired post will be subjected to Computer based Test followed by Document verification. 1. Executive: CBT will consist of 120 Objective Type Questions divide into sections. Section-I will contain 96 subject concerned questions and 26 questions on General Knowledge & Reasoning Abilities. 2. Junior Executives: The question paper will be objective type containing 120 questions based on basic educational standards required for the post.Topics namely General Knowledge/Awareness, Arithmetic, General Intelligence and reasoning, General Science and Technical ability. 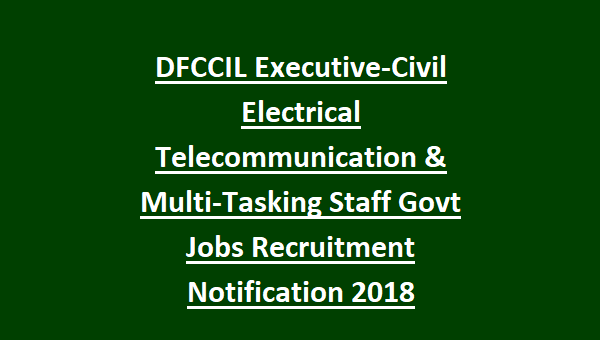 Candidates seeking possession under DFCCIL Executive-Civil/Electrical/Telecommunication & Multi-Tasking Staff Jobs Recruitment 2018 can refer the official notification.